The Rain or Shine Elasto Painters’ identity through the years has been tied with that of Coach Yeng Guiao – brute, fiery, unpredictable. It’s a team that everybody loves to hate because of their physicality and ruggedness on the court. They’re often perceived as the bullies, the villains, and the bad boys. But Guiao has always maintained that they just play according to their system. They are rough, but they are not dirty. They bang bodies with their opponents, but they do not intend to hurt anybody. 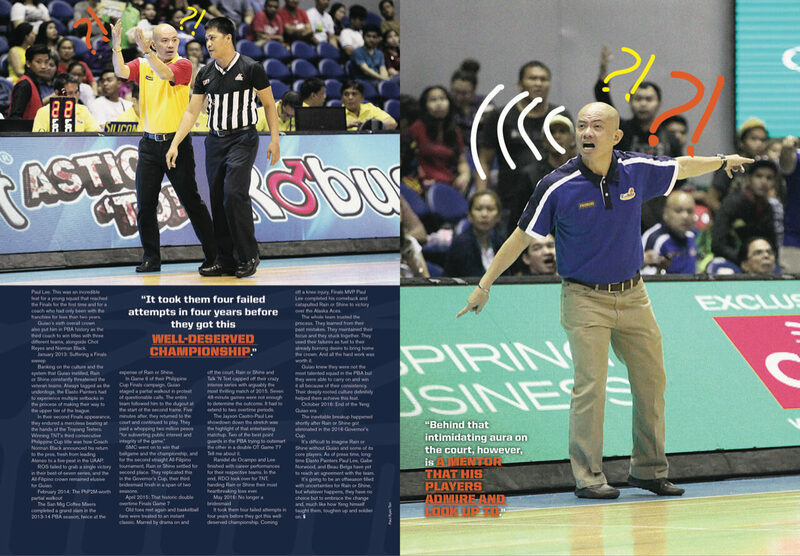 We frequently see Guiao on the sidelines being highly emotional. A game is not complete without him reprimanding his players or shouting invectives to the referees. He has always been very vocal – and I’m being very kind with words here – about his displeasure with the officiating. His collection of technical fouls, ejections, and hefty fines and penalties is unmatchable. Behind that intimidating aura on the court, however, is a mentor that his players admire and look up to. Initially called the Welcoat Dragons when they joined the PBA in 2006, the franchise was a nobody in a sea of tried-and-tested clubs. Just like typical newcomers, they became cellar dwellers in their early years in the league. They began their steady rise when the multi-titled coach took charge in 2011. Guiao ingrained a winning culture in Rain or Shine. He valued continuity that resulted to undeniable team chemistry. He developed guys that would probably not blossom as much and as fast had they played for another coach. If you looked at their roster, you would wonder how a bunch of role players could flourish the way they did. The no-superstar approach allowed each of them to shine. When I heard the rumor that Guiao was about to leave Rain or Shine, it suddenly made sense why his and ten Elasto Painters’ expiring contracts were not renewed immediately. For a recently crowned team to have its coach and players hanging like that was a bit alarming. I thought after bagging the recent Commissioner’s Cup trophy, it would be easy to come to terms and re-sign the brilliant tactician that made it happen, IF he planned on staying. While I’m not privy to what exactly caused him to make the big switch, I’d like to believe he did it for valid and understandable reasons. Fans may be disappointed, frustrated, and even angry about it. 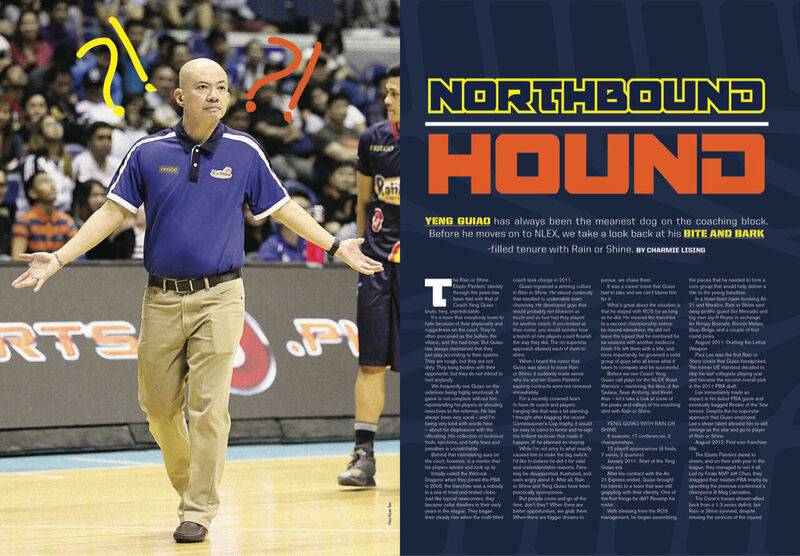 After all, Rain or Shine and Yeng Guiao have been practically synonymous. But people come and go all the time, don’t they? When there are better opportunities, we grab them. When there are bigger dreams to pursue, we chase them. It was a career move that Guiao had to take and we can’t blame him for it. What’s great about the situation is that he stayed with ROS for as long as he did. He steered the franchise to a second championship before he moved elsewhere. He did not leave the squad that he mentored for six seasons with another mediocre finish. He left them with a title, and more importantly, he groomed a solid group of guys who all know what it takes to compete and be successful. Before we see Coach Yeng Guiao call plays for the NLEX Road Warriors – mentoring the likes of Asi Taulava, Sean Anthony, and Kevin Alas – let’s take a look at some of the peaks and valleys of his coaching stint with Rain or Shine. After his contract with the Air 21 Express ended, Guiao brought his talents to a team that was still grappling with their identity. One of the first things he did? Revamp his roster. With blessing from the ROS management, he began assembling the pieces that he needed to form a core group that would help deliver a title to the young franchise. In a three-team trade involving Air 21 and Meralco, Rain or Shine sent away prolific guard Sol Mercado and big man Jay-R Reyes in exchange for Ronjay Buenafe, Ronnie Matias, Beau Belga, and a couple of first round picks. Paul Lee was the first Rain or Shine rookie that Guiao handpicked. The former UE standout decided to skip his last collegiate playing year and became the second overall pick in the 2011 PBA draft. Lee immediately made an impact in his debut PBA game and eventually bagged Rookie of the Year honors. Despite the no-superstar approach that Guiao employed, Lee’s sheer talent allowed him to still emerge as the star and go-to player of Rain or Shine. The Elasto Painters dared to dream, and on their sixth year in the league, they managed to win it all. Led by Finals MVP Jeff Chan, they snagged their maiden PBA trophy by upsetting the previous conference’s champions B-Meg Llamados. Tim Cone’s troops almost rallied back from a 1-3 series deficit, but Rain or Shine survived, despite missing the services of the injured Paul Lee. This was an incredible feat for a young squad that reached the Finals for the first time and for a coach who had only been with the franchise for less than two years. 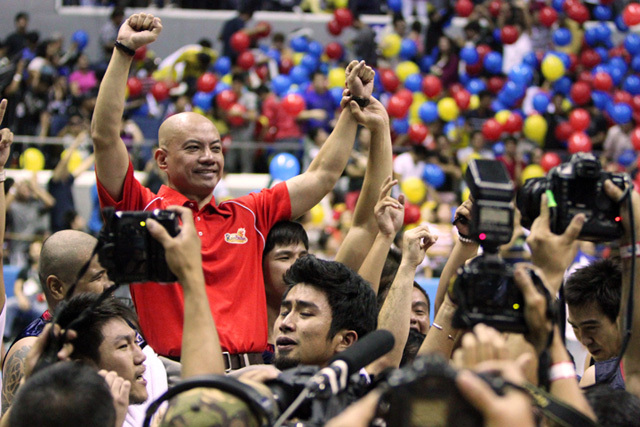 Guiao’s sixth overall crown also put him in PBA history as the third coach to win titles with three different teams, alongside Chot Reyes and Norman Black. Banking on the culture and the system that Guiao instilled, Rain or Shine constantly threatened the veteran teams. Always tagged as the underdogs, the Elasto Painters had to experience multiple setbacks in the process of making their way to the upper tier of the league. In their second Finals appearance, they endured a merciless beating at the hands of the Tropang Texters. Winning TNT’s third consecutive Philippine Cup title was how Coach Norman Black announced his return to the pros, fresh from leading Ateneo to a five-peat in the UAAP. ROS failed to grab a single victory in their best-of-seven series, and the All-Filipino crown remained elusive for Guiao. The San Mig Coffee Mixers completed a grand slam in the 2013-14 PBA season, twice at the expense of Rain or Shine. SMC went on to win that ballgame and the championship, and for the second straight All-Filipino tournament, Rain or Shine settled for second place. They replicated this in the Governor’s Cup, their third bridesmaid finish in a span of two seasons. Old foes met again and basketball fans were treated to an instant classic. Marred by drama on and off the court, Rain or Shine and Talk ‘N Text capped off their crazy intense series with arguably the most thrilling match of 2015. Seven 48-minute games were not enough to determine the outcome. It had to extend to two overtime periods. The Jayson Castro-Paul Lee showdown down the stretch was the highlight of that entertaining matchup. Two of the best point guards in the PBA trying to outsmart the other in a double OT Game 7? Tell me about it. Ranidel de Ocampo and Lee finished with career performances for their respective teams. In the end, RDO took over for TNT, handing Rain or Shine their most heartbreaking loss ever. It took them four failed attempts in four years before they got this well-deserved championship. Coming off a knee injury, Finals MVP Paul Lee completed his comeback and catapulted Rain or Shine to victory over the Alaska Aces. The whole team trusted the process. They learned from their past mistakes. They maintained their focus and they stuck together. They used their failures as fuel to their already burning desire to bring home the crown. And all the hard work was worth it. Guiao knew they were not the most talented squad in the PBA but they were able to carry on and win it all because of their consistency. Their deeply-rooted culture definitely helped them achieve this feat. The inevitable breakup happened shortly after Rain or Shine got eliminated in the 2016 Governor’s Cup. It’s difficult to imagine Rain or Shine without Guiao and some of its core players. As of press time, long-time Elasto Painters Paul Lee, Gabe Norwood, and Beau Belga have yet to reach an agreement with the team. It’s going to be an offseason filled with uncertainties for Rain or Shine, but whatever happens, they have no choice but to embrace the change and, much like how Yeng himself taught them, toughen up and soldier on.